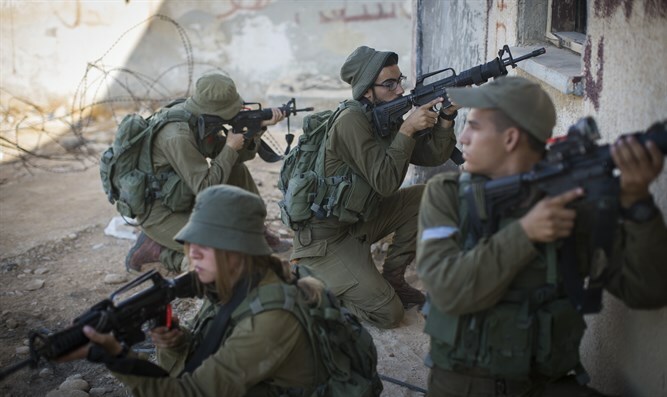 The Brothers in Arms organization called on the IDF to re-think its policy regarding its mixed-gender battalions on Wednesday. The call comes in the wake of reports that the response of IDF soldiers to the shooting attack at the Ariel junction on Sunday was defined as an operational failure. The battalion in question is the Thunder Brigade in the Artillery Corps, a mixed-gender battalion. "The fatal attack this week at the Ariel junction is a warning sign for the IDF and all Israeli citizens," the Brothers in Arms organization stated. "The situation in the mixed battalions cannot continue like this. The IDF must rethink the matter." "Unfortunately, these battalions are occupied with an agenda instead of military matters," the organization continued. "Serious problems exist involving injuries and professional qualifications. These battalions cannot fulfill their required duties." "The battalion's Facebook page is full of posts about Women's Day celebrations and other topics promoting the agenda of integrating female soldiers into the IDF. The battalion commander published a post about a barrel decorated with flowers. Where do you see a battalion commander in the IDF who publishes a post like this to his soldiers? It's simply not the place. This is not a private company - it's an army. It seems that someone there has forgotten that before advancing agendas, the soldiers must fight." "The IDF must begin to return to its real mission - striving for victory - and cease to be a tool in the hands of the infantry who want a weak, feminine army with no toughness," the organization added. The organization mentioned that they understand that this topic is extremely sensitive right now considering the proximity to the date of the attack. "We understand that these are sensitive matters, but we feel that it's vital to say this now in order to prevent the next failure or disaster and save the lives of soldiers and civilians."